Washington Crossing Historic Park is a 500-acre (2 km²) site operated by The Pennsylvania Historical and Museum Commission in partnership with the Friends Of Washington Crossing Park. The park is divided into two sections. 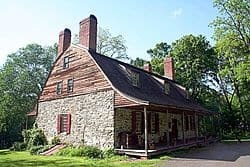 One section of the park, the “lower park,” is headquartered in the village of Washington Crossing located in Upper Makefield Township in Bucks County, Pennsylvania. It marks the location of where George Washington crossed the Delaware River during the American Revolutionary War. The lower park includes 13 historic buildings including McConkey’s Ferry Inn, where General George Washington and his aides ate dinner and made plans prior to the crossing. Among the historic buildings is a 20th-century barn that houses 5 replica Durham Boats. Durham boats were large, open boats that were used to transport pig iron along the Delaware River at the time of the Revolution and these boats, along with the ferries and others, were used to transport soldiers, horses, and equipment across the river on the night of December 25–26, 1776. The replica boats are used each Christmas when the famous crossing is re-enacted in the park. Located 4.5 miles away in Solebury Township, Bucks County, Pennsylvania, is the park’s northern section, the “upper park.” In its 100-acre area it contains (0.4 km²) Bowman’s Hill Tower and the Thompson-Neely House, which was used as a military hospital during Washington’s encampment in the area, and the graves of an estimated 40 to 60 soldiers who died there. The exact location of the graves is unknown, though they were partially unearthed during the construction of the nearby Delaware Canal in the early 19th century and during other nearby construction projects. Presently there are 23 memorial headstones as a reminder that the area is a gravesite. The lower park contains a visitor’s center, which was renovated from July 2011 to March 2013. The newly renovated visitor’s center was opened March 10th 2013. It features a small exhibition with some Revolutionary war artifacts, and an original letter written by George Washington while in the Mckonkey’s Ferry Inn. The park also has obtained a full size digital copy of Emanuel Gottlieb Leutze’s “Washington Crossing the Delaware” from the Metropolitan Museum of Art, that is hanging in the auditorium. The park was created in 1917 and the Washington Crossing Park Commission was established in 1919 to administer and develop the park. The park was formed to commemorate the famous Crossing as the “Turning point of the American Revolution.” The Commission’s first objective was to develop the site as a historical shrine and its second objective was to preserve its natural beauty and develop its areas for recreational use. Bowman’s Hill Tower was built to commemorate what may have been a lookout point for General George Washington’s troops to watch the banks of the Delaware River for enemy activity. The park also contains the Bowman’s Hill Wildflower Preserve and the surrounding area is the natural habitat for many native plants, trees, animals and birds. Today the park serves to preserve and interpret the site of the Washington’s Crossing of the Delaware. 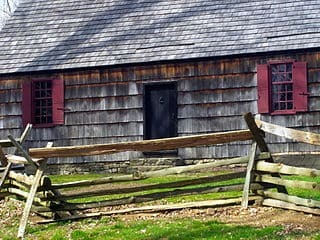 The park is administered by the Pennsylvania Historical and Museum Commission (PHMC). Cuts in funding from the Commonwealth of Pennsylvania forced the PHMC to reduce park staffing, which resulted in closing the park to the public in late November, 2009. 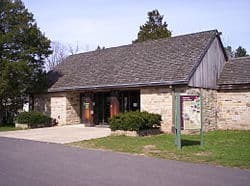 The Friends Of Washington Crossing Park, a 501(c)(3) private, non-profit corporation, was incorporated in January 2010 to support the PHMC in operating Washington Crossing Historic Park, and the park re-opened to the public in the spring of that same year. The Friends of Washington Crossing Park re-opened the park’s gift shop in December 2010. 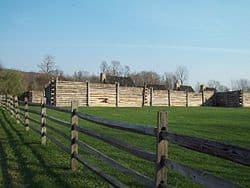 Current full-time, on-site staffing consists of 2 museum professionals and 2 maintenance personnel provided by the PHMC, who work in conjunction with the part-time staff of historical interpreters provided by the Friends of Washington Crossing Park. Washington Crossing Historic Park is open for guided tours Thursdays through Sundays from 10am – 4pm, April 1 – December 31. The recreational areas of the park, including the picnic pavilions, are open to the public from dawn to dusk all year. This very historical site holds a reenactment of General Washington crossing the Delaware River every Christmas Day, plus other public programs on related themes throughout the year. It was added to the National Register of Historic Places in 1966. On the night of December 25–26, 1776, General George Washington and a small army of 2,400 men crossed the Delaware River at McKonkey’s Ferry, Pennsylvania on their way to attack a Hessian garrison of 1,500 in Trenton, New Jersey. The crossing, made during a time when morale was at its lowest point during the American Revolution, renewed hope among the Continental Army, Congress and the general population. The soldiers and the Continental Army had contracts and they were all paid out, General Washington gave one of his most famous speeches, convincing the tired, hungry, miserable soldiers to stay at least until they had finished this battle, and they did. Later, at the Battle of Trenton, they were able to force the Hessian soldiers to surrender, without any American casualties.